© ANDRZEJ WOJCICKI/SCIENCE PHOTO LIBRARYPlant pathologist Jean Ristaino hunts down crop-threatening diseases all over the world. 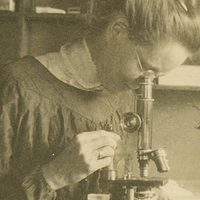 Last year, in the span of two months, she visited India, Uganda, and Taiwan to help colleagues track the fungus Phytophthora infestans, which infects tomatoes and potatoes and caused numerous famines in 19th-century Europe. Ristaino tracks the pathogen’s modern march using farmers’ online reports of outbreaks of the disease, called late blight; then she travels to those locations to collect fungal samples. In her lab at North Carolina State University in Raleigh, Ristaino’s team genotypes fungi from these farms to trace their origins and monitor how P. infestans’s genome is changing in response to fungicide use and how it’s subverting immune strategies the host plants use to defend themselves. 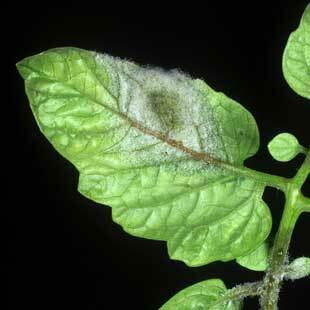 Just like animals, plants have to fight off pathogens looking for an unsuspecting cell to prey on. Unlike animals, however, plants don’t have mobile immune cells patrolling for invaders. “Every cell has to be an immune-competent cell,” says Jeff Dangl, who studies plant-microbe interactions at the University of North Carolina at Chapel Hill. The molecular details of these and other pathways have yet to be worked out, however. “Mechanistically, it’s still rather opaque,” says Jonathan Jones, a plant immunologist at the Sainsbury Laboratory in Norwich, U.K.
Scientists are now filling in the gaps in their understanding of plant immunity, and discovering previously unsuspected roles for factors such as microbiota composition and circadian rhythms. If they can understand a plant’s defenses, maybe they can engineer more-robust crops, introducing immune genes that may have been inadvertently bred out of modern varieties. Some are also looking to alter known immune receptors so that plants can recognize pathogens despite adaptations that help the invaders fly under the immune radar. Collectively, these strategies could help plant breeders keep up with economically devastating pathogens like P. infestans. By inserting so-called effector proteins directly into a plant cell’s cytoplasm, bacterial and fungal pathogens can interfere with signaling cascades downstream of PRRs, or directly target hormone pathways and transcription factors to prevent PAMP-triggered immunity. That’s when the plant’s second line of defense kicks into gear. The cells sense the bacterial effectors by means of other receptors, called intracellular nucleotide-binding domain, leucine-rich repeat receptors (NLRs), that trigger secondary immune cascades. NLRs provide flexibility in the plant immune system. Arabidopsis only has about 150 NLR proteins—not nearly enough to cover the wide range of potential pathogen effectors the plant may encounter. 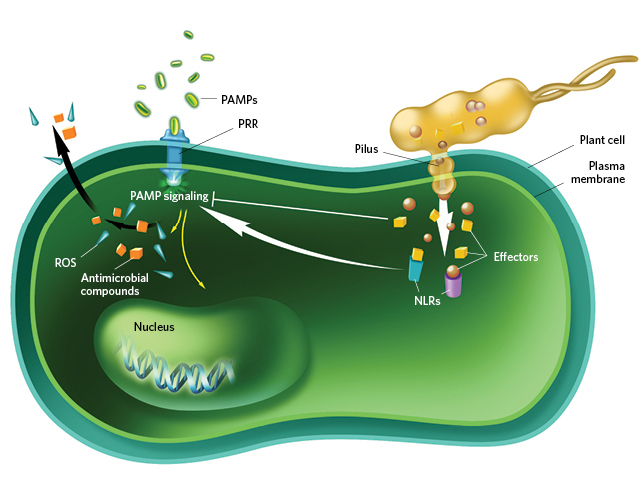 But NLRs don’t just recognize pathogen effectors; many recognize plant proteins targeted by those effectors.2 For example, the bacterium Pseudomonas syringae produces a protease that degrades a plant protein called RIN4, which is involved in PAMP-triggered immunity. RIN4 binds to an NLR called RPS2, so when the bacterial protease results in lowered levels of RIN4, RPS2 notices the protein’s absence and initiates an alarm signal.3,4 “If the host figures out how to recognize your action as a protease activity, then you’re useless,” says Dangl. By recognizing damaged proteins as “modified self,” one NLR can detect the presence of many effectors, which often go after the same host targets. Jones says decoy NLRs can offer a helpful shortcut for identifying the signaling proteins that link immune receptors and defense-gene activation. Any decoy domain fused with an NLR is likely to be a target of a pathogen effector, and therefore likely to be involved in plant immunity. Cataloging plant immune genes and understanding how they work are also vital to breeding and engineering crops that can stand up to rapidly mutating pathogens. Although diverse genetically modified (GM) crops are now widely sold and consumed, the vast majority of today’s growers still rely on chemical pesticides. In the U.S., farmers spend an estimated $77.1 million per year on fungicide to combat late blight alone.8 Such treatments are often too expensive for growers in the developing world, says Ristaino. So researchers are turning to genetic methods to shore up the plants’ defenses. “Host resistance [is] probably the best way to reduce losses,” she says. FIGHTING BLIGHT: Strategies to fight Phytophthora infes­tans, an oomycete that causes late blight in tomatoes and pota­toes, cost US farmers tens of millions of dollars each year.© NIGEL CATTLIN/SCIENCE SOURCEThe most direct way to implement knowledge of plant immune pathways in agriculture is to introduce the immune genes themselves into plants. Many wild relatives of domesticated crops still harbor so-called resistance (R) genes that defend plants against specific pathogens. Once these genes are identified, researchers can breed or engineer them into the genomes of modern fruits, vegetables, and grains. One of the first R genes bred into crops, which codes for an NLR called R3a, came from a wild relative of the potato called Solanum demissum. In the early 20th century, researchers discovered that the wild potato plant was resistant to P. infestans and began crossing it with cultivated potato varieties to transfer that resistance into the crop. R3a recognizes a P. infestans effector called AVR3a, but since R3a was introduced into domestic potatoes, a fungal variant that evades R3a detection has become more prevalent. To address this issue, Sophien Kamoun of the Sainsbury Laboratory is looking to alter R3a so it can bind this stealthy effector, called AVR3aEM. In 2014, his group used random mutagenesis to make a series of single amino acid changes to R3a and identified several that enabled the NLR to recognize AVR3aEM.9 The researchers also noticed that one of the mutant receptors bound an effector from a different fungal pathogen. “The really cool thing about this concept is it does open the door to engineering totally new synthetic receptors,” Kamoun says. By rec­ognizing damaged proteins as “modified self,” one NLR can detect the presence of many effectors, which often go after the same host targets. NLRs are not the only group of receptors that researchers are mutating to enhance pathogen resistance; they also engineer effector targets. Last fall, Michigan State University plant scientist Sheng Yang He and his colleagues described a single amino acid change in a plant hormone receptor called coronatine-insensitive 1 (COI1) that protected Arabidopsis plants from P. syringae infection.11 When the plant hormone jasmonate binds the COI1 receptor, it activates defense pathways against chewing insects at the expense of the plant’s immune response to bacteria. P. syringae, which causes a disease called leaf speck on tomatoes, produces a mimic of jasmonate, called coronatine, that binds COI1 to keep antibacterial immunity repressed.12 But a mutation in COI1 introduced by the researchers prevented binding with the bacterial mimic while maintaining normal jasmonate binding, making the plants resistant to P. syringae without compromising jasmonate-dependent defense against predatory insects. 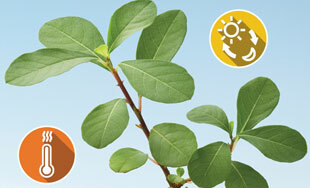 HOW PLANTS FIGHT OFF PATHOGENS: Plants have two basic immune pathways. First, a pattern recognition receptor (PRR) on the plant cell’s surface recognizes pathogen-associated molecular patterns (PAMPs) released by invaders and jump-start signaling pathways inside the cell that spur the production of reactive oxygen species (ROS) and antimicrobial compounds, as well as changes in gene expression and hormone levels. Second, intracellular plant protein complexes called nucleotide-binding domain, leucine-rich repeat receptors (NLRs) bind bacterial effectors and set off secondary immune cascades that boost the PAMP-triggered responses. NLR-binding can also lead to plant cell death, limiting the infection. He’s approach of mutating host targets to make plants less susceptible to pathogen attacks bypasses a major hurdle to breeding in new resistance genes. “There’s always this trade-off,” says Imre Somssich, a plant immunologist at the Max Planck Institute for Plant Breeding Research in Cologne, Germany. “If the R gene’s activated constantly, you get small plants.” Making plants impervious to bacterial subversion avoids the need for such heightened immune surveillance, conferring protection without compromising growth. But to really strike a balance between plant growth and immunity, scientists need to know how the cellular pathways regulating these processes converge. Patrick Schäfer, who studies plant immunity at the University of Warwick in the U.K., is examining how immune activation by bacterial flagellin affects cell-cycle pathways in Arabidopsis root cells. At the moment, he says, the endocrine system appears to be the strongest link between a plant’s growth and its resistance to pathogens. 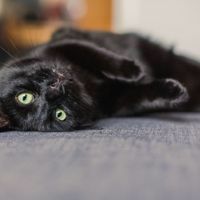 “It looks like the hormone pathways that are used by immunity are in part also used by growth signaling pathways,” says Schäfer. BALANCING PLANT IMMUNITY: Plant immune systems must integrate a diversity of factors to successfully fight off pathogens without harming the plant. Defense-related changes in hormone signaling, for example, can interfere with plant growth. Many species power down their immune systems at night, when growing ramps up. Plant immunity also fluctuates with changes in temperature, humidity, and light exposure, and is likely dependent on a plant’s microbiota below and above the soil. See full infographic: WEB | PDF© ISTOCK.COM/OKEA/TULPAHNDong’s group found that a central clock transcription factor called circadian clock-associated 1 (CCA1) activates resistance genes involved in defense against the fungus Hyaloperonospora arabidopsidis first thing in the morning, when the pathogen typically releases its spores.13 Last year, they reported that the plant’s redox clock, which is driven by changes in plant cell metabolism and hormone levels, works with the circadian clock to boost plant immunity in the morning and repress it in the evening, when plants do most of their growing.14 When the researchers perturbed the cycle by artificially inducing immunity of plants grown in the dark for a few nights in a row, the plants shriveled up and died. Historically, resistance genes have been bred into crops one gene at a time. But with just one mutation that lets it bypass a new resistance gene, a pathogen can decimate a field of genetically identical crops. “Late blight has been particularly notorious for doing that,” Ristaino says. 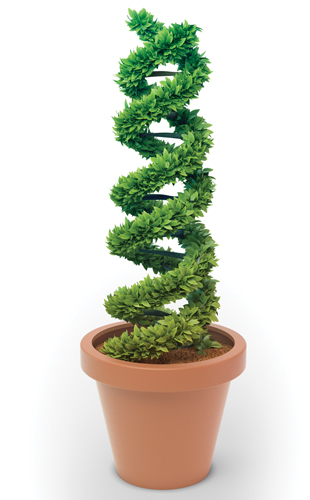 So instead of arming plants with individual genes, researchers are now looking to give plants whole suites, or “stacks,” of resistance genes. Although this can be done with conventional breeding, researchers and agriscience companies are increasingly drawn to new precision gene-editing techniques such as the CRISPR/Cas9 system. Last October, scientists in South Korea demonstrated that they could make precise genetic changes to several plant species using CRISPR guide RNA and Cas9 enzymes, without leaving behind any bacterial DNA.16 That same month, DuPont announced it would collaborate and share patents with Berkeley, California–based Caribou Biosciences to apply CRISPR technology to agricultural products in the next 5 to 10 years. Like conventional breeding, however, genetic engineering methods still face the challenge of keeping up with a pathogen’s rapid adaptation. 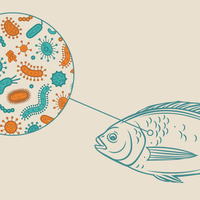 “You really can’t deploy stable resistance in the host unless you understand how the pathogen’s evolving in response to the genes being thrown at it,” Ristaino says. Amanda B. Keener is a freelance science writer living in Winston-Salem, North Carolina. A. Corral-Lugo et al., “Rosmarinic acid is a homoserine lactone mimic produced by plants that activates a bacterial quorum-sensing regulator,” Sci Signal, 9:ra1, 2016. J.D.G. Jones, J.L. Dangl, “The plant immune system,” Nature, 444:323-29, 2006. M.J. Axtell, B.J. Staskawicz, “Initiation of RPS2-specified disease resistance in Arabidopsis is coupled to the AvrRpt2-directed elimination of RIN4,” Cell, 112:369-77, 2003. D. Mackey et al., “Arabidopsis RIN4 is a target of the type III virulence effector AvrRpt2 and modulates RPS2-mediated resistance,” Cell, 112:379-89, 2003. 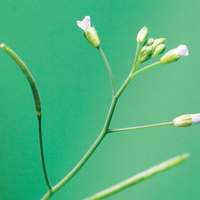 L. Deslandes et al., “Resistance to Ralstonia solanacearum in Arabidopsis thaliana is conferred by the recessive RRS1-R gene, a member of a novel family of resistance genes,” PNAS, 99:2404-09, 2002. P.F. Sarris et al., “A plant immune receptor detects pathogen effectors that target WRKY transcription factors,” Cell, 161:1089-100, 2015. C. Le Roux et al., “A receptor pair with an integrated decoy converts pathogen disabling of transcription factors to immunity,” Cell, 161:1074-88, 2015. J.F. Guenthner et al., “The economic impact of potato late blight on US growers,” Potato Research, 44:121-25, 2001. M.E. Segretin et al., “Single amino acid mutations in the potato immune receptor R3a expand response to Phytophthora effectors,” Mol Plant Microbe Interact, 27:624-37, 2014. A. Giannakopoulou et al., “Tomato I2 immune receptor can be engineered to confer partial resistance to the oomycete Phytophthora infestans in addition to the fungus Fusarium oxysporum,” Mol Plant Microbe Interact, 28:1316-29, 2015. L. Zhang et al., “Host target modification as a strategy to counter pathogen hijacking of the jasmonate hormone receptor,” PNAS, 112:14354-59, 2015. J. Cui et al., “Pseudomonas syringae manipulates systemic plant defenses against pathogens and herbivores,” PNAS, 102:1791-96, 2005. W. Wang et al., “Timing of plant immune responses by a central circadian regulator,” Nature, 470:110-14, 2011. M. Zhou et al., “Redox rhythm reinforces the circadian clock to gate immune response,” Nature, 523:472-76, 2015. S.L. Lebeis et al., “Salicylic acid modulates colonization of the root microbiome by specific bacterial taxa,” Science, 349:860-64, 2015. J.W. Woo et al., “DNA-free genome editing in plants with preassembled CRISPR-Cas9 ribonucleoproteins,” Nat Biotechnol, 33:1162-64, 2015.